This famous photograph appeared on the cover of Life magazine and on hundreds of newspaper front pages around the world. Eisenstaedt, a well-known photographer for much of the 20th century, walked with his camera snapping away at the hundreds of joyful soldiers and civilians who had gathered in Times Square, New York City as news of the end of World War II began to flash across the airwaves. 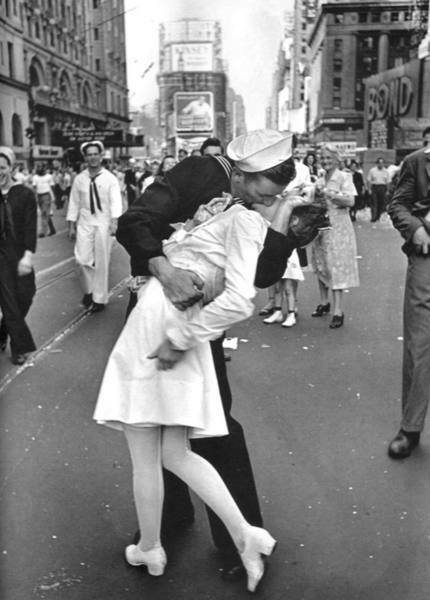 Eisenstaedt’s photo creates a perfect wordless image to convey the spontaneous joy of human celebration. Eisenstaedt, Alfred. ©TIME.com. http://www.gallerym.com/work.cfm?ID=69. Accessed 3 August 2010.